Smoky bacon rolled up into jumbo cinnamon rolls. This is one breakfast treat that will blow your mind. So simple and so flavorful. These totally over-the-top cinnamon rolls combine two of the best breakfast foods of all time — bacon and cinnamon rolls. This dish couldn’t be easier to put together and will be sure to impress everyone at the breakfast table. 1.Preheat oven to 375 degrees F and line a baking sheet with a Silpat liner or parchment paper, set aside. 2.Open the container and set the frosting aside. 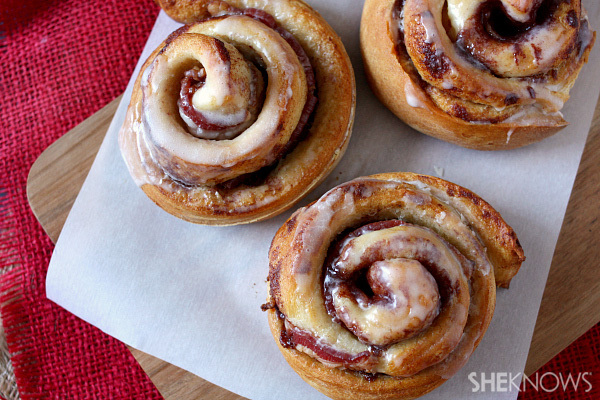 3.Unroll each cinnamon roll and lay a slice of bacon onto the dough. Roll the cinnamon roll back up and place onto the prepared baking sheet. 4.Bake for about 20 minutes until fully cooked and spread frosting over the warm rolls.